Before we were born on this earth, we lived with our Father in Heaven and Jesus Christ. We learned many things. Heavenly Father told us that in order to become like Him, we had to leave heaven for a while. When He presented the plan of happiness to us, we shouted with joy. We knew that being part of a family and making choices would be an important part of our life on earth. We liked the plan and agreed to come and live on the earth. Some children came to live in Africa, and some children came to live in South America. Others came to many different parts of earth. No matter where they live, what color their skin, or the language they speak, all children are children of God. All children can learn how to return to our Father in Heaven again. You could use the following activity for a lesson in family home evening or a talk in Primary. 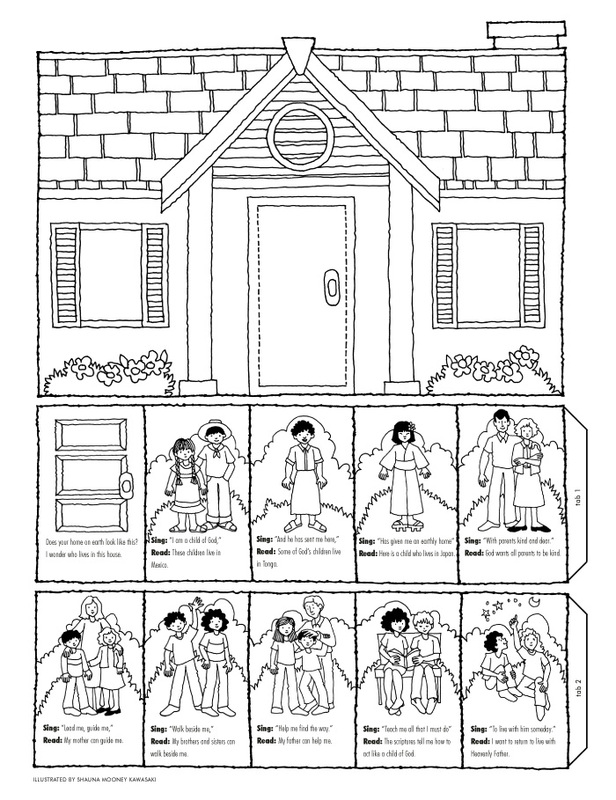 Color the house on page F9 the same color as your house. Cut it out, and glue it to heavy paper. Cut slits along the dotted lines on each side of the door. Color the two picture strips. Cut them out, and glue tab 1 to the other picture strip to make one long strip. Slide one end of the picture strip through the slits on each side of the door. Glue tab 2 to the other end of the picture strip (see illustration). 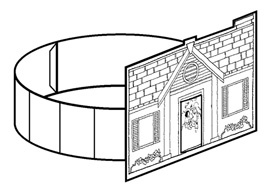 Position the picture strip so you start with the picture of the door. Read the two sentences printed on the door. Show the next picture, sing the words printed from the song “I Am a Child of God” (Children’s Songbook, 2–3, or Hymns, no. 301), and then read the sentence. Continue this procedure until you have shown all the pictures, sung the song, and read all the sentences. Does your home on earth look like this? I wonder who lives in this house. Read: These children live in Mexico. Read: Some of God’s children live in Tonga. Read: Here is a child who lives in Japan. Read: God wants all parents to be kind. Read: My mother can guide me. Read: My brothers and sisters can walk beside me. Read: My father can help me. Read: The scriptures tell me how to act like a child of God. Read: I want to return to live with Heavenly Father.